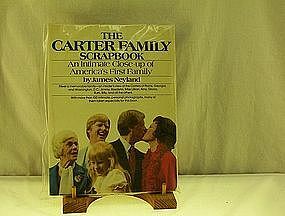 The Carter Family Scrapbook an intimate close-up of America's First Family by James Neyland is a paperback with copyright 1977 first printing 1977. It is sold as USED in very good condition. 102 pages black and white pictures the cover however is in color. Any questions please email me. Will mail media rate for $5.00 to USA address. Will accept money orders and cashier checks. Will also accept personal checks with UP to 10 days to clear. Thanks.